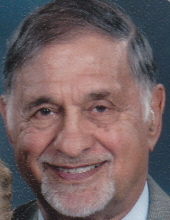 Joe was born March 14, 1927 in Hartford, Connecticut the son of John Antonio and Willamena DeTullio Violano. He married Janet Myers on August 16, 1953 at the First Christian Church, Bloomington, IL. She survives. Also surviving his daughter, Julie (Rod) Brandt, McLean, IL, 2 grandchildren, Jessica (Chad) Kleinschmidt, Armington, IL, Dathan (Abby) Powell, Springfield, IL, 4 great-grandchildren, Finn and Oscar Powell, Springfield, IL, Kensie and Cooper, Kleinschmidt, Armington, IL, 3 brothers and 3 sisters. He is preceded in death by parents and 1 brother. He was self employed contractor. He was a member of the First Christian Church, Bloomington, IL where he sang in the church choir. He served in the US Navy and during WWII. He was a member of the Wade Barney Masonic Lodge #512 AF & AM. Joe was also a member of the McLean County Senior Golf Association. He was a loving husband, father, grandfather, great-grandfather and brother. He will be missed by all who knew him. "Email Address" would like to share the life celebration of Joseph J. "Joe" Violano. Click on the "link" to go to share a favorite memory or leave a condolence message for the family.